Serve and Bluebird are both offering a free $50 credit when you make two direct deposits of $250+. If you haven’t taken advantage of this offer already, it’s time you do. I continually put it off for one reason or another, but I finally completed the requirements earlier this week. I know constantly changing your direct deposit account at work can be a real pain, but you don’t have to for this offer! Fortunately, Amazon Payments and a few other bank’s “Bill Pay” feature count as a direct deposit on Serve. 1. If you haven’t already, sign-up for Amazon Payments and Serve/Bluebird. 2. Login to AP and select “Edit My Account Settings” in the menu bar. Then select “Add a bank account” in the “Payment Settings” section. 3. You should be at the page shown below, which is where you can enter your account and routing numbers. Quick note: You will need your license number as well if you are sending money to a personal bank account, which you are. 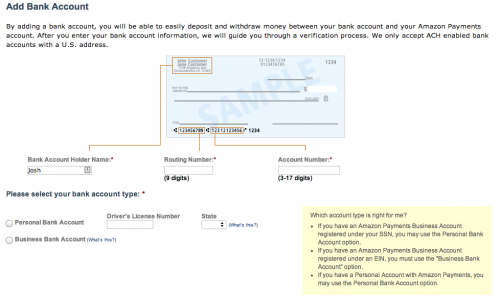 If by chance, you are sending money to a business account you will need to fax Amazon a copy of your bank statement. 4. 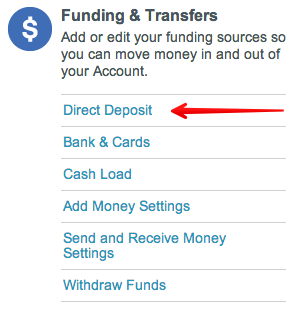 Enter your Serve/Bluebird routing and account number, which you can find by logging into Serve and going to Settings > Direct Deposit. 5. Now that you entered the account and routing numbers on Amazon Payments, you will need to verify your bank account. Unfortunately, there’s no way to verify it instantly so you will have to wait for the two deposits to show up in your account. 6. For some reason, AP never took that $0.17 back from my account. So, this verification will earn you anywhere from $0.01-$1! It took about 2 business days for the test deposits to appear in my account. 7. Once you verify Amazon Payments, simply load your AP account and select “Withdraw Funds”. Enter anything over $250 and submit. I did two $400 withdrawals back to back on 6/20 and the $50 bonus appeared on 6/23 with the $800. This offer ends on 7/31/14 so don’t wait! The whole process takes about 5-7 business days. You can do both the direct deposits at the same time. Bluebird has the same offer right now and the process should be about the same.